Wags 4 Hope holds pet responsibility crafts where children learn how to properly take care of their pet through a fun activity! With each animal I capture on canvas, I envision one in need that I am helping. My family began searching for three years through countless pet stores, shelters, newspapers, and private dog breeders for a loving and loyal friend. Our search happily ended when my family was searching the Internet and stumbled upon a two-year-old shaggy dog that had been rescued from a high-kill shelter in Houston, Texas. Teddy was saved by Houston Shaggy Dog Rescue. At his veterinarian check up, it soon was discovered that he tested positive for heartworm disease through an antigen test. Teddy had to be given two injections of arsenic and remain in a crate. It broke my heart to know that my dog had endured great pain. Having learned the devastating effects of heartworm from my loving companion, I seek to raise awareness of Teddy’s story. I decided to sell my custom animal portraits to help other animals like Teddy. Wags 4 Hope also works to encourage responsible pet ownership. His wagging gives me hope that so many other animals can be saved. I enjoy painting dogs and cats. I thought it would be a great idea to sell my custom artwork to benefit animals in need. I welcome requests for farm animals as well! My paintings are done in acrylic paint/ or watercolors. Some pets next to their portrait! 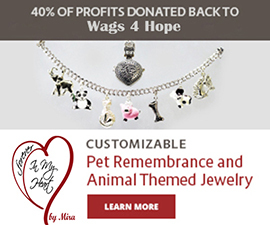 Check out where Wags 4 Hope has been featured and read some of my pet articles! In light of April being National Heartworm Disease Awareness month, I created and designed an educational flyer, which I had spread to all 50 states, parts of the UK, Australia, and West Africa. I did this by contacting animal welfare organizations, pet friendly hotels, and universities. It was truly incredible to be able to share my story, and communicate my mission personally on the phone to hundreds of pet owners. Each heart on the map below indicates where my flyer has been. can hear all about Teddy’s adventures! Wags 4 Hope is a 501(c)(3) nonprofit organization. Wags 4 Hope accepts monetary donations and animal goods (food, toys, blankets, etc.) If you are a company that would like to donate, you will receive a special shout out on the Wags 4 Hope Facebook page and your name featured below alongside other donors. Please send me an email if you can help in anyway. Special thanks to PetMeds for their donation of flea prevention for animals in need! Come wag with me on Social Media!